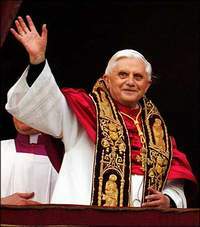 Pope Benedict XVI has become the first and only icon of style of the 21st century in the world of priesthood. Benedict, who is considered to be a champion of discipline and humility, unexpectedly brought new tendencies in the Vatican, Sueddeutsche wrote. Benedict’s first public appearance became a little disaster: his gown was a little short for him. The new Pope could do nothing about it. Gammarelli, the company that makes gowns for Vatican priests and popes in particular (since 1792) made the clothing of three different sizes because no one knew who of the cardinals was going to replace the deceased Pope John Paul II. Unfortunately, none of the produced models could fit the newly elected head of the Vatican. British tabloids wrote soon after that that Pope Benedict XVI preferred Gammarelli to Raniero Mancinelli – the firm that was making him soutanes during his activities as a cardinal. The head of Gammarelli was infuriated with those rumours. Spokesmen for the company said that Mancinelli was an upstart company, whose history of business counted only 20 years. The Vatican officials were forced to make an official statement for the press in which it was said that Gammarelli was still considered the official tailor of the Vatican, and the scandal was exhausted. When a cardinal, Benedict was mainly wearing black. Now he can be seen dressed up in gorgeous purple and red outfits trimmed with fur and golden buckles. During his holiday in the mountains the Pontiff was spotted wearing a white baseball cap. Pope Benedict XVI does not hesitate to use the clothing of worldwide known brands in his wardrobe. He made a public appearance once wearing mirrored Gucci sunglasses. The press service of the Vatican does not distribute any information about the Pope’s stylist. The official tailor of the Vatican, Gammarelli, does not share this information either. A Gammarelli store is the most exquisite one on Via dei Cestari near the Pantheon. This street is like Via Montenapoleone for Vatican priests. It sells pink gloves with golden embroidery and luxury fabric for bishops and cardinals. Another store, called Salvi, sells a variety of magnificent golden crosses. Those are the most beautiful crucifixes that you can ever imagine. The market of such luxurious church items is apparently small, but it exists. A Raniero Mancinelli store can be found right behind the Vatican gates. There is a picture hanging on the wall depicting Mancinelli standing beside the Pope. The shop owner says that they regularly make clothes for the Pontiff. Rainardo Mancinelli did not specify the prices of the Pope’s outfits. “It is priceless,” he said. People started talking about Benedict’s sense of style last year, when the Pontiff appeared in red Prada shoes that accompanied his liturgical clothing. Prada’s spokespeople were surprised to see the Pope wearing their shoes. However, they definitely feel proud of such unexpected success. None of Catholic priests can wear what they want. A set of rules about the clothes written on 100 pages appeared in 1907. There are strict rules about the cut, the fabric and the color.